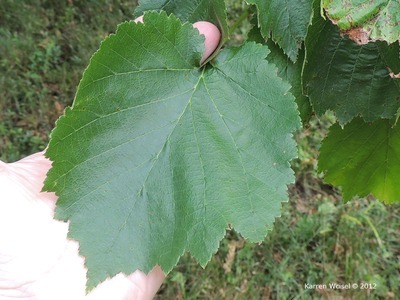 The leaves are alternate, simple, with a coarsely toothed (doubly serrate) margin. The shape is somewhat cordate, at least at the base, with an acuminate (tapering to a point) leaf tip. The size ranges from 2.5 to 6 inches.